No, we can't. But maybe we can find a way to move forward, Foggy. Foggy: Last time you went after Fisk, I found you half dead! More than half. You go after him in the mask again, he might kill you. Or you might kill him, which would probably have the same effect on someone as Catholic as you are. Matt: What am I supposed to do? How do I stop him? Foggy: By using the law, Matt. Like you told me and Karen to do. That's how we take him down. Matt: We? Though Nelson and Murdock were over. Foggy: There's nothing I want more that to find a way back to where we were, but I don't know if we can. Matt: No, we can't. But maybe we can find a way to move forward, Foggy. 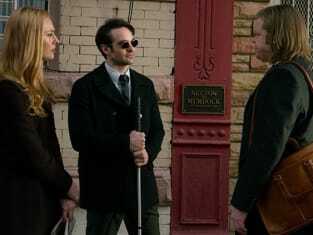 Daredevil Season 1 Episode 13: "Daredevil"
Leland: All right, okay, Jesus. I figured you'd find out sooner or later. What's a guy gonna do? Fisk: Wesley found out, didn't he? He confronted you and you shot him. Leland: I have no idea what happened to Wesley. I wasn't a part of that. Fisk: But you had something to do with the benefit, didn't you? You and Gao? She's gone, you're stealing from me. Leland: It's not what you think. Fisk: You tried to kill me. Leland: The poisonings at the benefit were just to make it look like someone was trying to get at you. But you were never the target. Permalink: I figured you'd find out sooner or later. What's a guy gonna do? Father Lantom: How you holding up? Matt: Like a good Catholic boy. Father Lantom: That bad, huh? Matt: He was a good man. And he's gone because I haven't stopped what's happening to this city. Father Lantom: Can't put that on yourself, Matthew. You've done everything you can. A lot you probably shouldn't have. Matt: And here we are. Permalink: He was a good man. And he's gone because I haven't stopped what's happening to this city.